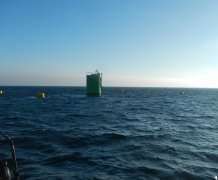 The final section of a sophisticated wave energy device has been successfully installed by a collaborative research team in the Bay of Biscay, on the northern coast of Spain. The new device, dubbed Marmok-5, uses waves power to spin turbines that drive an associated electricity generator, which can produce up to 30kW – enough to run a medium sized business. The final part for the commissioning of the device, a mooring load measurement unit that will provide a data link to monitor extreme conditions at the site, was recently installed by a team of experts from University of Exeter, Oceantec Energías Marinas and dive company CDA Bilbao. The monitoring system, which provides high resolution measurement of mooring tensions and device motions, will also enable a greater understanding of operational and extreme conditions at other energetic wave energy sites. A second 12 month deployment phase is scheduled for 2017, when polyester ropes used in the mooring system will be replaced with a novel elastomeric mooring tether developed by the University of Exeter. Lars Johanning, Principle investigator for the project and an expert in Ocean Technology from the University of Exeter's Penryn Campus in Cornwall said: "This collaborative European wave energy demonstration project will generate important data, that will enable the next phase towards commercialisation of energy generation from the ocean. The wave energy technology development has been supported by the European project OPERA ('Open Sea Operating Experience to Reduce Wave Energy Cost'), a multi cross European project, where the University of Exeter is addressing the design and cost challenge of the mooring through the introduction of a novel mooring elastomeric tether. OPERA, a European Union's Horizon 2020 research and innovation programme , will develop technology to enable a reduction in offshore operating costs, paving the way for a 50% long term reduction in costs, thus accelerating the establishment of international standards and reducing technological uncertainties and technical and business risks.